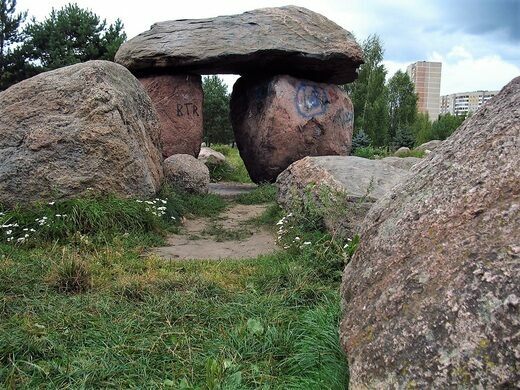 A unique park tells the geological history of Belarus in a national “map” of thousands of boulders and blue spruce. At first glance it seems like an ordinary park, until you notice the unusual number of boulders. This is the Museum of Stones, an open-air geological gallery created during the waning years of the Cold War to celebrate the unique topography of Belarus. The apartment building where JFK's assassin lived after defecting to the Soviet Union. This Minsk museum has cat coffee, cat chess, cat art, and even a cat "staff," which visitors are free to take home. The 18-acre Museum, just outside of central Minsk, gathered thousands of carefully chosen boulders from every corner of the country, including some with ancient carvings, and curated them into a singular vision. Together with molded land formations and tree plantings, the park forms a kind of large-scale national map. It was designed in the mid-1980s by a team from the National Academy of Sciences to replicate features of the Belarusian landscape, by using the placement of 2,135 stones, paths, blue spruce, and varying elevations. The ambitious project (the scale of the “map” is 2000:1 in the horizontal plane, and 100:1 in the vertical) had only gotten started at the time of the collapse of the Soviet Union. In the wake of the post-communist chaos, funding dried up, and where there had been hope for explanatory signage, docent-led tours, and well-run support facilities, there are now weedy paths, graffiti, and stolen signs. Still, the park is a popular spot for picnics and kids to climb, and many of the “exhibits” have secret stories to tell. There is a “Boris Stone” (one of several mysterious boulders that were discovered around the River Dvina with medieval inscriptions), and others with carvings of both Paganism and early Christianity. Some represent minerals commonly found in Belarus, and many, by their composition, reveal their long glacial journey from the Arctic tens of thousands of years ago. It may look like a bunch of big rocks, but first glances can be deceiving. The Museum of Stones is found just outside of the Minsk Beltway on the eastern side of the city, a short walk from the Uručča (Уручье) metro station. It's located in a park open 24/7 and there is no admission fee. Lines from a walking song are etched into a rock in Natural Bridge State Park.